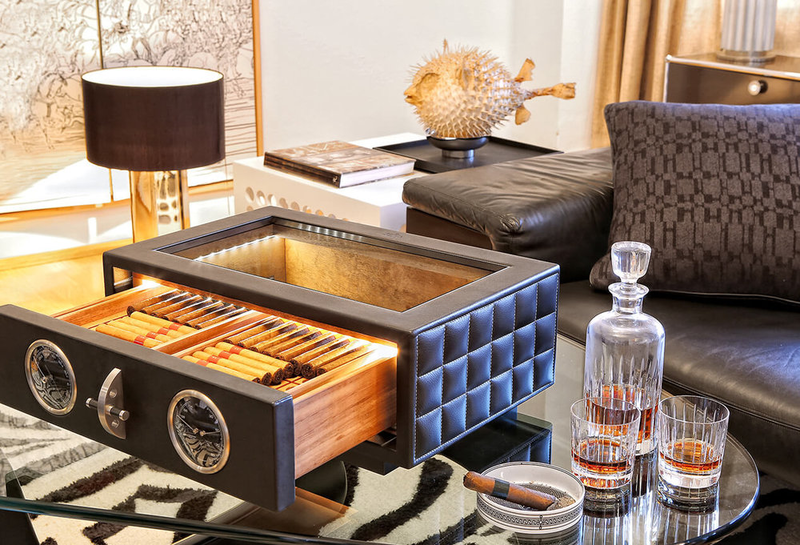 The new Humidor may seem familiar to some enthusiasts of Döttling as it is modeled after the integrated humidor functions of the “The Fortress” series. After numerous customer requests, Döttling now offers the tabletop version for your home, office or man cave. Some unrivaled features include a Spanish cedar interior atmospherically showcased by LED spotlights. The heart of every humidor is, of course, the humidifier for the precious cigars inside – featured in the photos are PATORO cigars. In the case of the table top Humidor, a CIGARSPA humidifying product is integrated into the drawer. Its performance can be monitored at any time with the help of a hygrometer, barometer, and thermometer made of brushed stainless steel. And because your individual desires are Döttling's primary focus, the interior of this unique case can be configured as a storage box for watches as well. The featured Humidor is covered in high-quality calfskin. However, numerous other surfaces, including wood or a high-gloss varnish, are possible upon request to customize your unique Döttling Humidor.